Rakesh Khurana's scholarship on organizational behavior provides, for him, a guiding philosophy to approach his deanship. 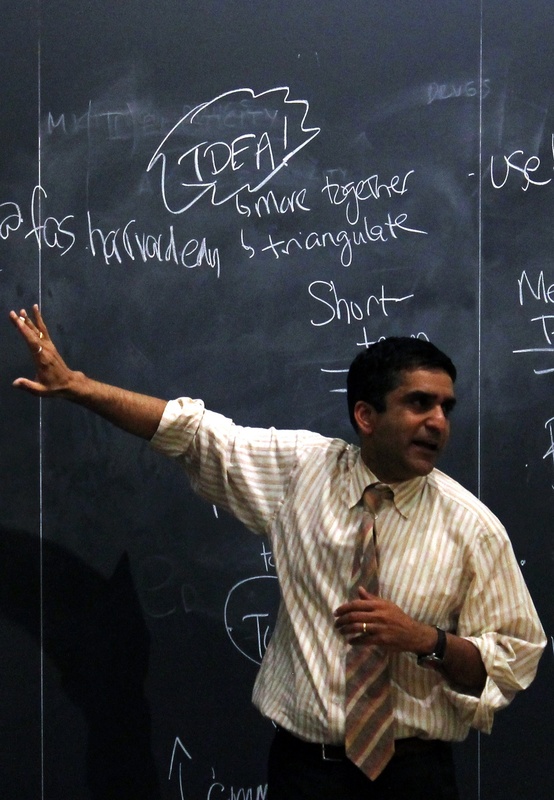 More often than not, students taking one of Rakesh Khurana’s classes at Harvard Business School could not see their professor. Khurana, now dean of the College, disdained the traditional spot by the blackboard, instead lecturing from the fringes of the classroom. Khurana would teach from “everywhere: the front, the back, the side,” according to former student Nworah B. Ayogu ’10. At times, Khurana even switched seats with students, asking them to stand by the board in his place, Agoyu remembers. Groysberg says Khurana’s teaching reflects the way the dean thinks about leadership: as a group process requiring universal input. Groysberg, along with other Business School colleagues and former students, say Khurana’s belief in team governance dictated his teaching style and informs his approach to leading Harvard’s flagship school. 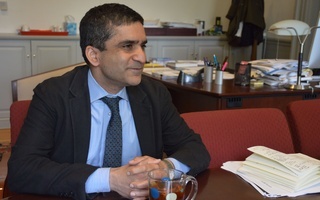 Khurana was named Dean of the College in 2014; he has served on the Business School faculty since 2000, and as co-Faculty Dean of Cabot House since 2010. In a January 2014 email announcing Khurana’s appointment, Dean of the Faculty of Arts and Sciences Michael D. Smith praised the new dean’s “distinctly inclusive” style of leadership. 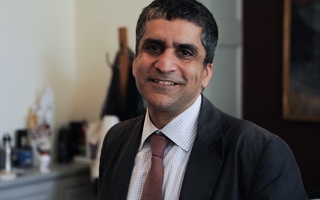 Dean of the College Rakesh Khurana holds professorships in Sociology in the Faculty of Arts & Sciences and Leadership Development at Harvard Business School. Khurana says he is skeptical of what he calls “capital ‘L’ leadership.” He adds that he thinks everyone is a leader, and that he is just one of thousands of leaders on Harvard’s campus, all working together to improve the College. He agrees that this idea of governance—as well as his broader academic scholarship in the field of organizational behavior—has heavily influenced how he conducts himself as dean of the College. Set to take effect with the Class of 2021, the policy bars members of single-gender final clubs and Greek organizations from holding certain fellowships and leadership positions on Harvard’s campus. Since the rollout of the legislation, many have come to see Khurana—despite his desire to be an “invisible” leader—as the face of the penalties. In emails sent to faculty and students over the past year, Khurana has called the policy a crucial, high-stakes effort to improve campus culture. “Given the problematic impact the USGSOs have on undergraduate life, it would not be ethically or administratively responsible to pause our efforts to solve these problems,” Khurana wrote in one email, referring to Harvard’s single-gender social groups. Some students and faculty have spoken out harshly against what they call Khurana’s policy, holding protest rallies in the Yard and writing critical op-eds in national newspapers. 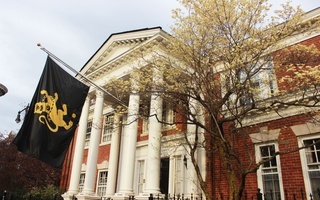 The same month the penalties debuted, Computer Science professor and former Dean of the College Harry R. Lewis ’68 introduced faculty legislation explicitly designed to kill the sanctions. The first class of Harvard students likely to be affected by the policy will set foot on campus this fall, ushering in another major test of Khurana’s deanship. As before, he says he will plumb his scholarship for answers. Khurana first came to know Harvard miles away from his current office in University Hall. 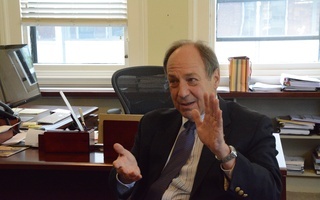 He arrived at the Business School, located across the Charles River from the College’s campus, as a doctoral student in 1993 and stayed to become a professor. Over the span of two decades at the school—interrupted only by two years spent across town as an assistant professor of management at MIT—Khurana studied the hiring patterns and practices of elite institutions. In his 2002 book “Searching for a Corporate Saviour,” Khurana explored how corporations select top executives, arguing that arbitrary social and cultural factors—often predicated on exclusivity—saddled firms with underperforming CEOs. 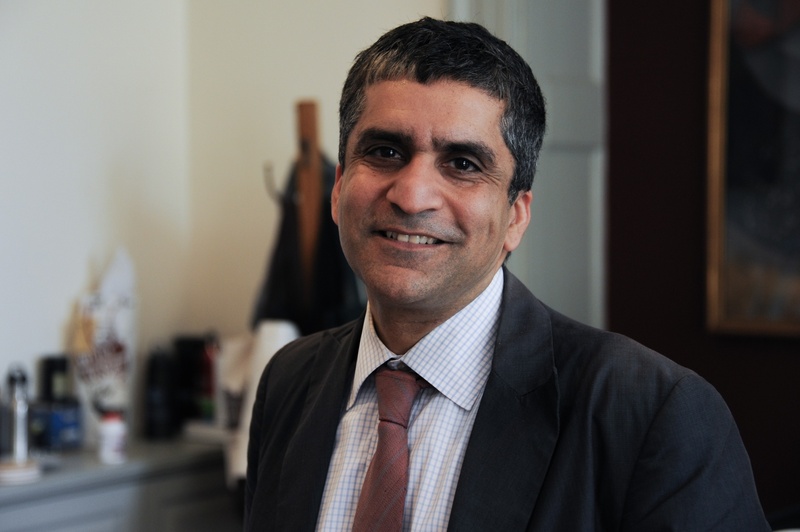 Business School colleagues say Khurana’s background in organizational behavior all but ensured he would address Harvard’s relationship with its unrecognized single-gender social groups as dean. Khurana agrees that this idea of governance—as well as his broader academic scholarship in the field of organizational behavior—has heavily influenced how he conducts himself as dean of the College. “I would say it is very consistent with his scholarship and very consistent with who he is as a person,” Business School Professor Joshua D. Margolis says of the College’s policy. Margolis says that, throughout Khurana’s career, the dean has examined how institutions fall away from their “fundamental values and purposes” and sought ways those groups could rectify their failures. 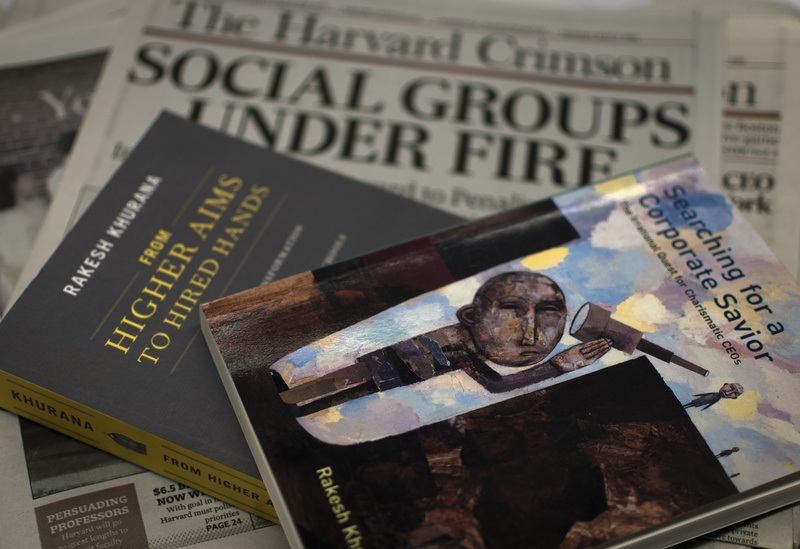 Khurana has consistently argued that the “fundamental purpose” of top-tier organizations like Harvard, given their power and privilege, is to advance the public good. He refers to this as a “social compact”: the highest caliber students and faculty come to Harvard, and in return, the College must provide them with a “transformative” experience that equips them to become better leaders for society. 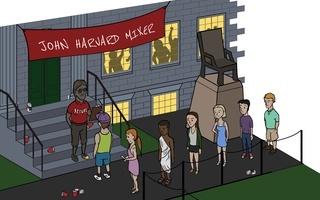 As dean of one of the most elite colleges in the world, Khurana has applied this philosophy to arguably the most elite institutions on campus: the single-gender final clubs that rule Harvard’s undergraduate social scene. Colleagues say they believe Khurana chose to penalize these groups in part because he thinks they render the College unable to uphold the social compact he prizes. Scott A. Snook, a senior lecturer at the Business School who has known Khurana since both were Ph.D. candidates, says that the dean has long investigated the role that elites and elite organizations play in society. Khurana himself says he believes exclusive groups like the clubs directly hinder Harvard’s ability to entice gifted students. “I believe there’s a direct line between attracting the best talent and the most people who want to make a difference in the world and the kind of environment and culture they find themselves in,” Khurana says. While Khurana’s penalties on members of single-gender social groups stem in part from his desire to return Harvard to its founding principles, they are also informed by a belief that leaders must govern by example. Asked to identify Khurana’s administrative style, seven Business School colleagues offer the exact same response: they say Khurana practices “values-based” leadership. This theory holds that leaders model standards that extend to their constituents. “Those virtues can be infused and transposed in ways that extend far beyond who the person is, what behaviors they exhibit, or what context they’re operating in,” explains Ryan L. Raffaelli, an assistant professor at the Business School. Snook calls “values-based leadership” the theory that has underpinned Khurana’s entire career. “Khurana has always led with his values—it’s animated his research, his passion for why he wants to write, why he wants to study what he studies, and now it’s animated the impact and the issues he wants to take on as a leader in the role of the capacity of the dean,” Snook says. 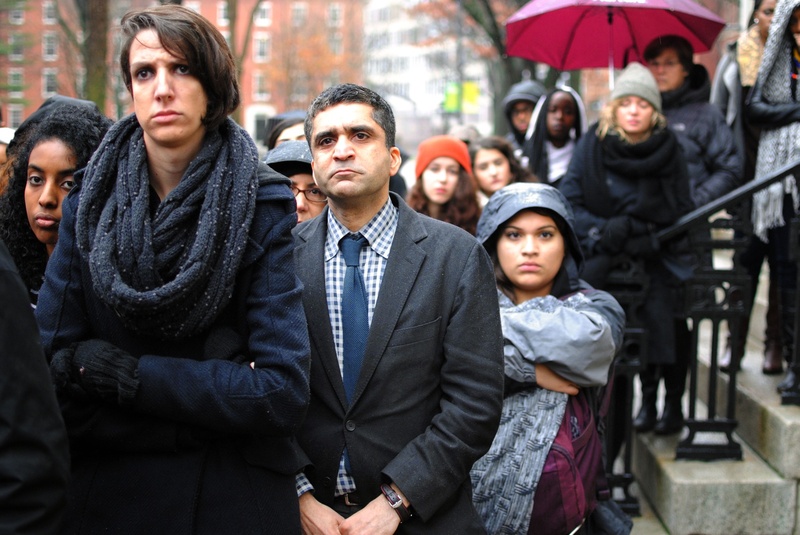 Dean of Harvard College Rakesh Khurana stands among members of the Harvard community at a protest in December outside University Hall in 2014. Students and coworkers on this side of the Charles say there is little doubt what primary value drives Dean Khurana: the mission of Harvard College. In his first major speech to undergraduates as the new dean of the College in September 2014, Khurana read out the College’s mission: to “educate the citizens and citizen-leaders for our society” and to provide students with an intellectually, socially, and personally “transformative” experience. In the three years since, Khurana has not stopped repeating the mission. “It’s almost like the ‘Our Father’ at this point,” former Dean of Student Life Stephen Lassonde said in 2014. Khurana says he will recite the 136-word statement “literally everywhere.” He adds he believes Harvard’s mission necessitates a campus that is “open to everyone”—one free, in his view, from social groups that discriminate based on gender. Colleagues and former students say that by speaking out against these groups, Khurana eventually hopes to transfer his values to students and spark a cultural shift on campus. The sanctions did spark social campaigns—though some were not the sort Khurana hoped to see. Following the rollout of the policy, Harvard students, faculty, and some outside observers spoke out harshly against the penalties. Critics of the policy say it infringes on students’ constitutional rights and argue it will do little to solve issues of social discrimination on campus. They also advance a critique that strikes at the heart of Khurana’s ideas about leadership: they say he crafted and debuted the sanctions in exactly the top-down, vertical fashion he tries to avoid. Leading up to the announcement of the policy, Khurana met repeatedly with social group leaders behind closed doors to discuss the legislation; he also canvassed the subject with other administrators. And in crafting the policy, he drew on hundreds of private student responses to College-administered surveys collected in recent years. Nonetheless, many on campus—especially professors—said they felt left out of the discussion. Facing mounting criticism from faculty, Khurana announced in late January that Smith was creating a faculty committee to determine whether the penalties will be “revised or replaced”—prompting Lewis to withdraw his anti-sanctions motion, for now. But even this step drew criticism for being too top-down, including from members of a different committee that had been working for months to recommend how to implement the sanctions. Minutes before Khurana announced the creation of the faculty committee to the school, implementation committee members received an email informing them the policy they were helping to enforce could be completely overhauled. Khurana gave the implementation committee no input, and no advance warning. “Nobody likes surprises in this community,” Lewis adds. In another potential blow to Khurana’s philosophy of team-style leadership, students have come to identify him—and him alone—with the policy. Results of The Crimson’s 2016-2017 senior survey showed that, among seniors, Khurana’s favorability has dropped to a low of 42 percent, down from 62 percent among the Class of 2016 and 82 percent for the Class of 2015. His declining popularity seems to be linked to the College’s social group policy: 81 percent of respondents who view Khurana unfavorably also oppose the sanctions. Khurana says he thinks about his identification with the penalties in two ways. On the one hand, he argues students are making an “individual attribution error”—he says he developed the policy in tandem with “senior leadership across the University,” among others. But he says he is not sorry to see some at Harvard taking him to task. Regarding the survey results, Khurana says he is sorry if he has “disappointed” students in the past year, adding he takes his low favorability ratings as “a failure on my part to communicate.” Nonetheless, he does not intend to abandon the policy. Khurana’s commitment to and rationale for the penalties stem from his core personal and academic credo—values he will continue to rely on going forward.